This page describe the acceptable uniforms for Enlisted men that are required for participation as a member of USSNC-LHC. 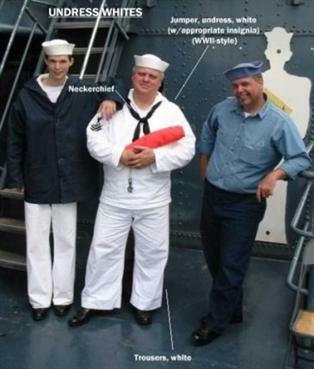 In the descriptions, as much info as possible is given to help you identify and properly wear WWII US Navy uniforms. We will provide you with sources for reproductions. 1. Dungaree trousers: WWII-era dungarees with the patch pockets have no outside seam on the trousers. 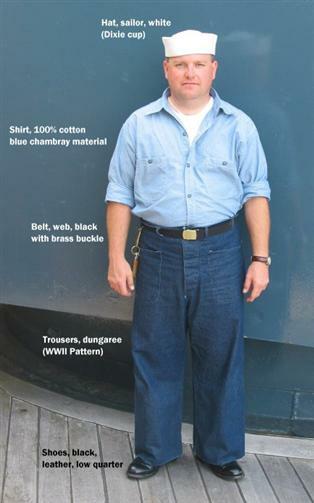 Modern Seafarer (1960-2000 issue) dungaree trousers are not an acceptable substitute for WWII dungaree trousers. 2. Chambray shirt: 100% cotton, blue chambray, long sleeve, two breast pockets (flaps or no flaps), blue 2-hole buttons and a placket on the front button edge. No ribbons, rating badges, service stripes, or specialty badges. The modern cotton-poly blend or other modern US Navy work shirts are not acceptable for wear during our events. They are of a different material, a different style and different seams. Chambray is a specific type of fabric with a distinctive pattern. There are a few current commercial chambray shirts that are acceptable. 3. Hat: White sailor hat. Modern ones are acceptable. 4. Shoes: Black low-quarter plain-toed (i.e. no toe cap) oxford style shoes are preferred. Brown rough-out boondockers are acceptable. 1. Undress White Jumper: White, 100% cotton with single left breast patch pocket. The jumper style changed from one patch pocket to two slash pockets in late 1950 - early 1960. Modern jumpers are polyester, have the slash pockets and not acceptable. 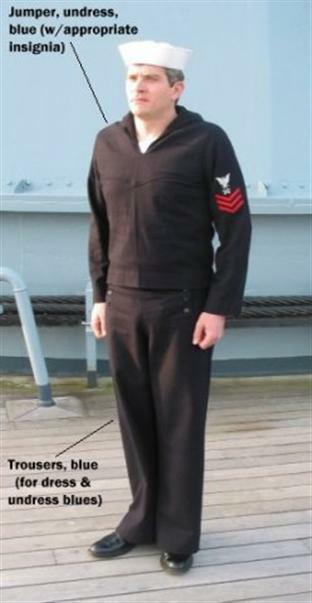 1960-era cotton jumpers (with slash pockets) are not acceptable to wear but can be used as part of the seabag/locker display as long as they are rolled/folded up. Wear with: rating badges, service stripes, specialty badges, and neckerchiefs. NO RIBBONS. 2. White Trousers: White 100% cotton button-fly navy trousers. Style from WWII through 1970s. Modern-issue polyester trousers are not acceptable. 3. Belt: White web belt with brass buckle. 4. Hat: White sailor hat. 1. Dress Blue Jumper: Melton wool, style from WWII-era through 1970's. Modern (1980-present) jumpers, although made of wool, are of a different material and color and are not acceptable. Wear with: ribbons, rating badges, service stripes, specialty marks, and neckerchief. 2. Undress Blue Jumper: Same as Dress Blues. Wear with: rating badges, service stripes, and specialty badges. Neckerchief as required or indicated. NO RIBBONS. 3. Blue Trousers: 13-button broadfall-front Melton wool Navy trousers WWII-era through 1970's. Modern (1980-present) blue trousers are not acceptable. The minimum acceptable haircut is to have the sides and back cut in a tapered style rather than a "Blocked" style. (Just tell your barber "tapered". If he/she doesn't know what that is, get a new barber.) You may have up to 2-1/2" of hair on the top, but it must be off the ears and collar and tapered (Tapered will keep it off the ears and collar anyway). Facial hair: Beards are not allowed in this impression. As such, you will shave every day of the event, including Sundays. You are not living in the field engaged in battle with limited water supply, you are on a battleship with access to water.